Hot on the heels of Tag Heuer's connected device and Fossil buying up Misfit, a company known for its affordable fitness trackers, HP, has teamed up with Switch watchmaker Movado for the Bold Motion smartwatch. This isn't HP's first time in the smartwatch rodeo, as it released the Chronowing with fashion designer Michael Bastian last year. 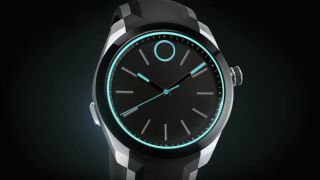 Available today on Movado.com for a hefty sum of $695 (about £457, AU$979), the Movado Bold Motion smartwatch comes from the Engineered by HP program that's paired with Movado for its fashionable designs. The watch has the typical array of features found on Apple Watch and Android Wear devices: email, calendar and social media notifications, along with activity tracking and haptics that buzz your wrist. HP developed the hardware modules, software and user interface, and is providing HP cloud services for all of the brand's smartwatches, though what that means specifically has yet to be determined. The Bold Motion is compatible with both Android (4.4 and up) and iOS (8 and up) devices. Similar to the Withings line, the Bold Motion seems to be a connected watch that lacks a touch screen with notifications displayed on the arm. Rather, the device syncs up to an app on your mobile phone to send you the notifications. This seems redundant since your phone already buzzes and sends you alerts, but it's apparent pushing out smart wrist gadgets is the next reasonable step for expensive analog watches. It's also clear that smartwatches don't always look good with the tech jammed inside. The partnership of tech and fashion companies such as HP and Movado seems like the best option to figure out what kind of smartwatches people want. Check out the video below to get a better picture of the Bold Motion in action.